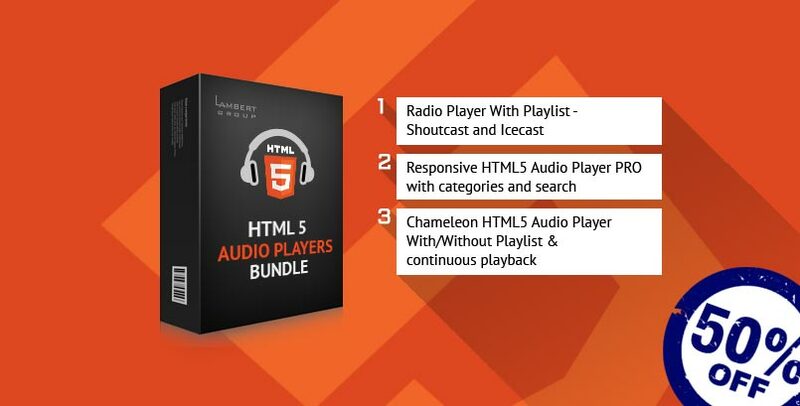 Responsive HTML5 Audio Player jQuery Plugins Bundle contains 3 HTML5 plugins which cover a vast area of audio players, from a simple MP3 player to a complex ShoutCast/IceCast radio player. A top-notch responsive HTML5 Audio Player compatible with all major browsers and mobile devices. Any color scheme is possible, customizable from parameters, so you can integrate this audio player in any design. Radio Player jQuery plugin, with playlist, categories and search, supports Shoutcast and Icecast radio streaming. The player uses Last.FM API to display the photo of the current playing singer. Only Radio Stream Needed – just add the radio stream and the player will get radio name, radio categories, current playing song and artist photo. You can use this product as a fully featured html5 audio player or just to add background music to your website. You can customize this html5 audio player by changing the color for: player background, volume slider, timer, buffer, seekbar, song title, playlist background, playlist font and playlist item line separator.